It is hard to believe we are here, the end of the year, the holidays, and maybe even cooler temperatures. We have had lots of sun in November and not enough rain. Usually, I’m able to turn off my sprinkler system in October and wait until March to turn them back on. Not so this year, everything is dry and I have to hand water to make sure that all the plants get a drink. What kind of gardening can we do this month? There is still a lot of gardening to do, even if it is December. 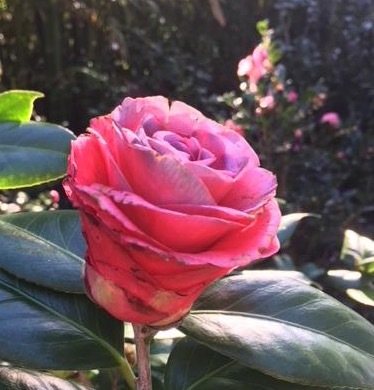 It is not too late to add color to your garden or containers, vegetables are still an option and camellias. Now for the freeze warning. If we have a freeze warning for our area, first water your plants; this protects the roots, so water thoroughly, not just for 60 seconds. Next, cover your plants tenting the fabric to the ground then secure it with pegs. Once the weather warms up remove the fabric. Use fabric made to protect plants or use fabric to cover the plant and plastic to cover the fabric, like a windbreaker. For hanging baskets, take them in or set them on the ground, water and cover. For plants in containers, take them in or water and cover. These instructions are for plants that are tender to the cold. This doesn’t freeze proof your tender plants but it will help add a little warmth and that may be all that is needed to save a plant. It is better to be prepared than scrambling around at the last minute trying to find your cold weather gardening supplies. So, place your N-Sulate cloth and pegs where you can find them. The Nursery usually keeps these supplies in stock if needed. These are just 3 examples of beautiful color for now. 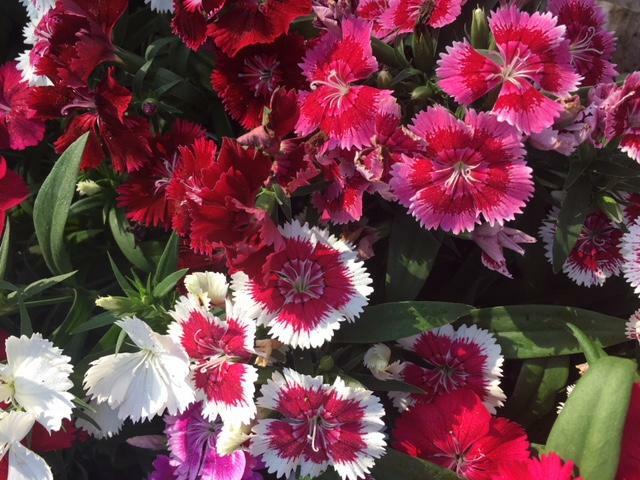 Brighten up your garden with any of these. What else can you plant in December? You can still plant vegetables. Plant cauliflower, broccoli, green onions, Brussels sprouts, leeks, greens, and turnips. Get busy now so you can eat soon! Herbs can be grown easily in a container. I like to start a couple of herb pots each season. In the fall and winter, I prefer the savory herbs. You may use almost any type of container. A lightweight plastic container is good if you need to move the pot around as the light changes during the season. 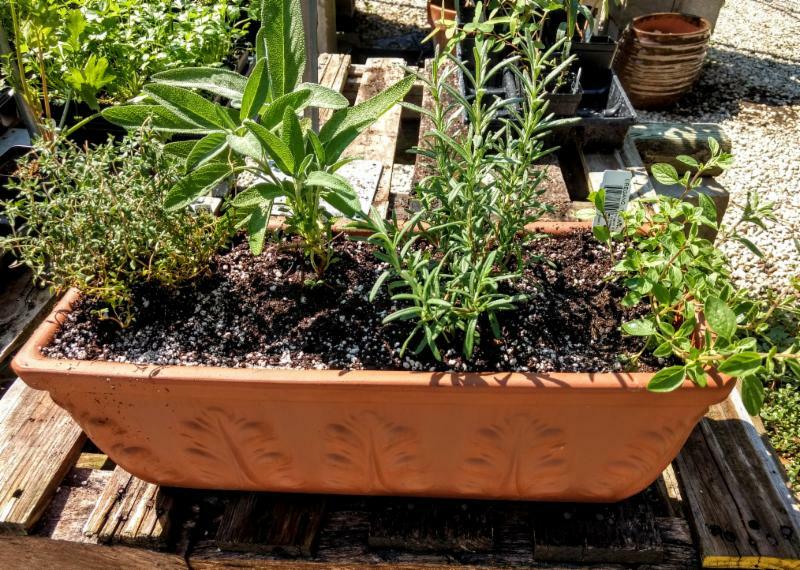 A 15-gallon container will fit six herb plants easily. Most herbs really only need about six inches of soil below to spread out their roots. A large terra cotta pot is a beautiful addition to a porch or patio but will be a bit heavy to move. A 16.5-inch pot will hold six herb plants. You may also plant herbs in a window box. A smallish version will easily hold four herb plants. I have parsley in a large mason jar in the kitchen window. A small Bay Laurel plant will do well in a small pot outside in the sunshine. Use good organic potting soil in a pot with several holes for good drainage. Then choose your favorite herb combinations. As the weather cools, I will be roasting root vegetables and making soups. Some of my favorite winter herbs are Sage, Rosemary, Oregano, Thyme and of course Parsley. Try roasting some beets with olive oil and rosemary. Or butternut squash with sage. Thyme is great with chicken and roasted vegetables. Sage and Bay leaves are great in soups and stews. Herbs are so easy to grow and so economical to have nearby for use in your cooking. Fresh herbs will really enhance the flavor of your dish. Give it a try, grow some herbs. With all the rain in May, hopefully, we haven’t all washed away. One benefit of the rain is June may be an extremely green month. If your yard is anything like mine, very much the blooming jungle, this rain is causing the plants to grow by leaps and bounds. I can’t seem to find the time when it is not raining to take the garden loppers, shears and maybe even the chainsaw to it. It seems impossible to even start, but start I must. Where to start? I will be cutting many plants way back; I need to be able to walk on the path in my yard. 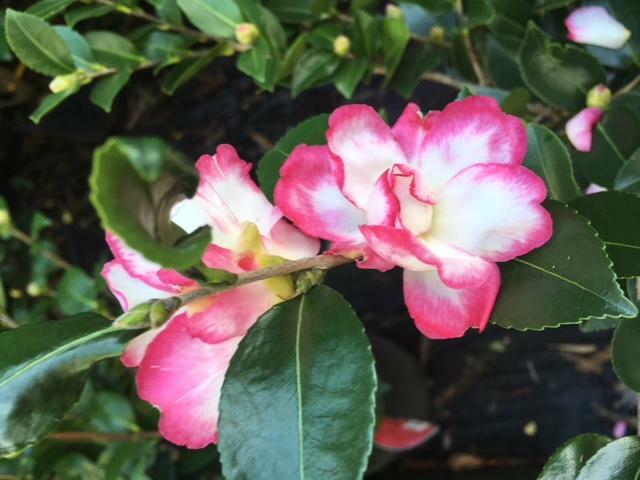 Now that it is June, I will not be trimming my azaleas or my camellias back. 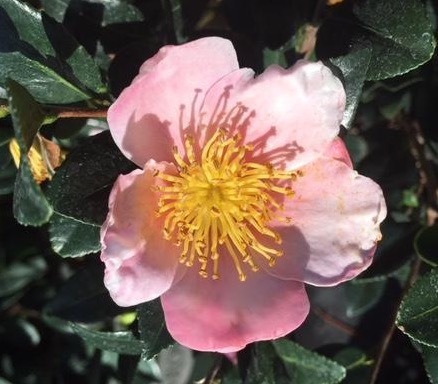 Camellias are now forming the flowers for next fall and winter and azaleas are now forming flowers for next spring. Pulling weeds is also on the list. Don’t waste garden space on weeds that use up valuable water without any return. IF the rain stops, we will all have to water. 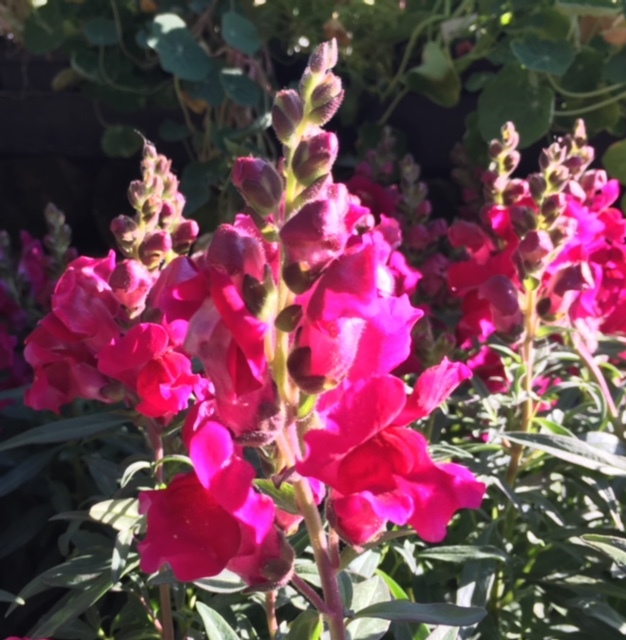 With the hotter temperatures most plants need more water. This is especially true for azaleas and camellias and any newly planted flowers, shrubs or trees. Have you seen all the new Hibiscus varieties at The Nursery? Wow! Is just the start of what I can say about them. 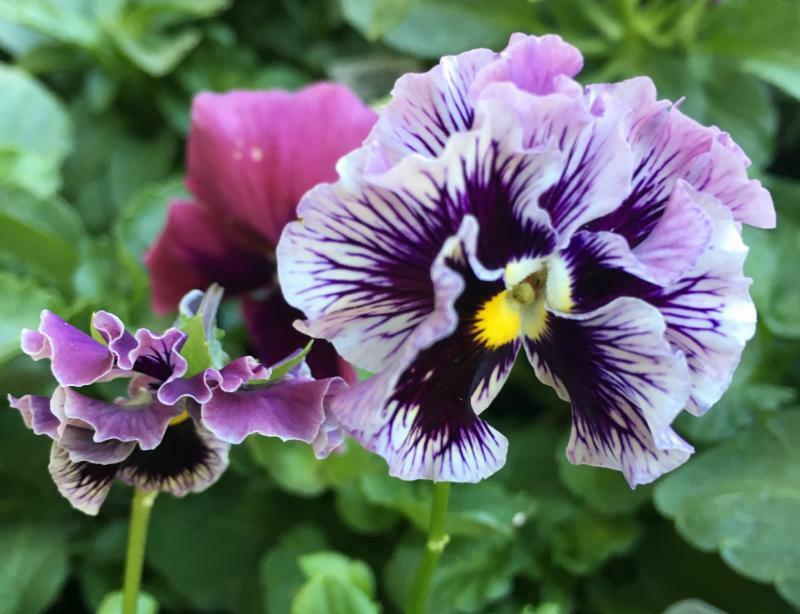 They are so incredible; it looks like someone has been tie dying the flowers. I had to have the Cherry Appaloosa hibiscus; it has the most incredible red flower with splashes of white. I added it to my Pink Lemonade and Gold Rain hibiscus. I have no room left for the other equally beautiful hibiscus like Space Oddity, the double flower of Time for Magic, Big Bang, Yellow Jacket and the never too old, Rumrunner. can cover the stems leaves and buds on the hibiscus. White flies are tiny white moths that lay eggs on the underside of leaves. White flies excrete honeydew that will cause sooty mold on the tops of the leaves. These pests can be jet sprayed off but that seems to just be a temporary fix. Triple Action Plus or Neem oil used in the early morning hours, seems to be a longer lasting fix. Spray the tops and undersides of leaves every 7-10 days. Don’t spray around or on beneficial insects. Some will recommend products that contain imidacloprid for problems with pests on hibiscus. This systemic insecticide product will work but the cost is that it also will kill bees and other beneficials in the garden when they feed on treated plants. Drizzle Organic Unfiltered Olive Oil in saute pan. Saute all of the Spinach, then set aside. Filet Chicken Breasts and prepare to pound. Place long strip of wax paper on counter top. Place breasts on wax paper, then cover with an additional strip of wax paper. Pound away until double in size. Remove top sheet of wax paper. Drizzle Breasts with Olive Oil, crack some salt and pepper on each Breast. Place cheese on each Breast and a nice portion of spinach on the cheese. Make sure all of the cheese is covered with the Spinach. Spread a little crushed walnuts on each breast or a lot. I love the Nutty flavor it adds to this dish. In a baking dish, make a bed of Spinach for each Breast. Roll the Breast up and tuck ends in. Turn the Breasts over and place on the Spinach beds. Drizzle with Olive Oil. Top with remaining crushed Walnuts. Bake 350 degrees for 30-35 minutes depending on size. Play with your food…. Enjoy!